A word of advice, if I may: bookmark this post. I have a feeling you’ll want to come back to it again in the near future. 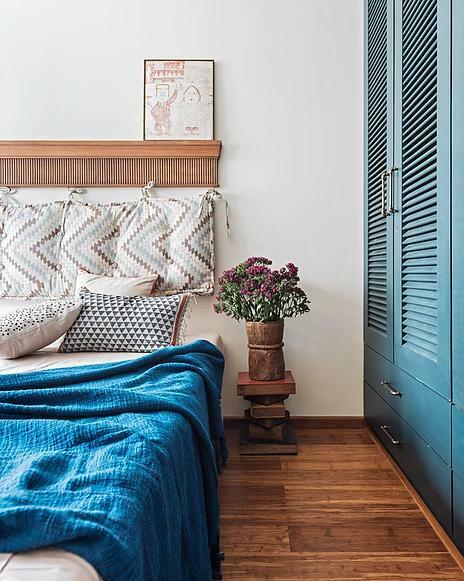 It is a reference point in interior design of all sorts: how to drape furniture in silk, adorn the floor in patterned tiles, and embellish the walls in jaw-dropping artifacts. As I was talking in these pictures, I was confused – whether to devour the floor or soak in the delight of that blue sofa. 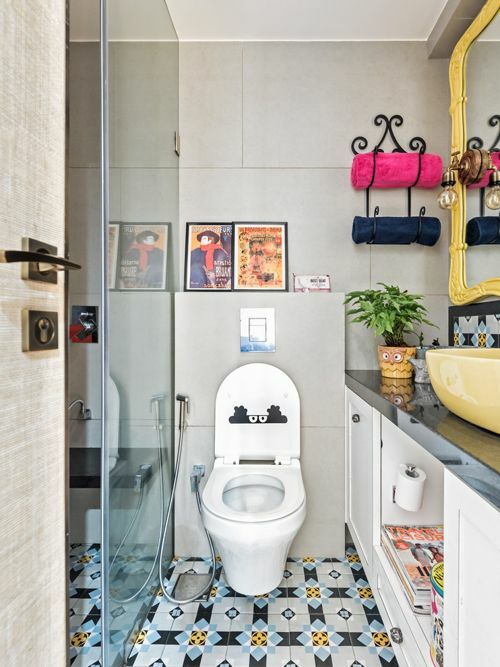 This vibrant 3-BHK apartment in Mumbai designed by PS Design belongs to Tiya and Ranjeet Thakur. Ranjeet is the co owner of Frames Production Company Limited which produces several shows like The Kapil Sharma Show, Dance Plus, Comedy Company, Nach Baliye etc. They have two children: Saisha and Mikhail. Please walk us through the home. The main door opens up to a L-shaped living, with a seating area on the right and the dining on the left. To the left of the dining is the kitchen and on the right is the built-in bar. Next to the bar is the entry to the guest bedroom which has an attached bathroom. 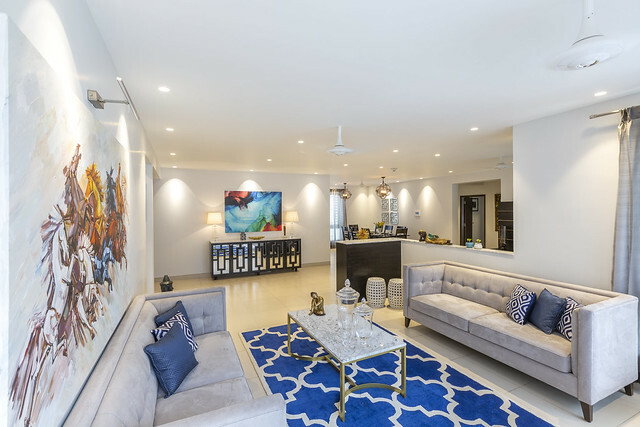 From the dining, you enter a common lobby which has access to the master bedroom on the right and kids bedroom on the left. The powder room can also be accessed from this lobby. 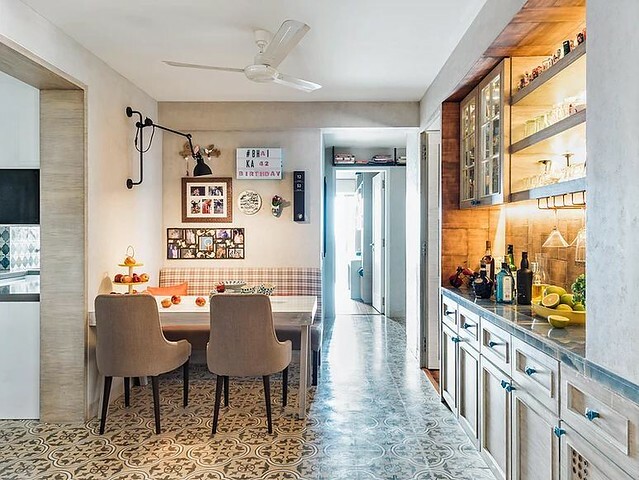 The showstopper of the house, especially in the living areas, is the self-patterned cement tile Bharat flooring. The bedrooms feature engineered wood floors. The walls sport lime plastered walls. 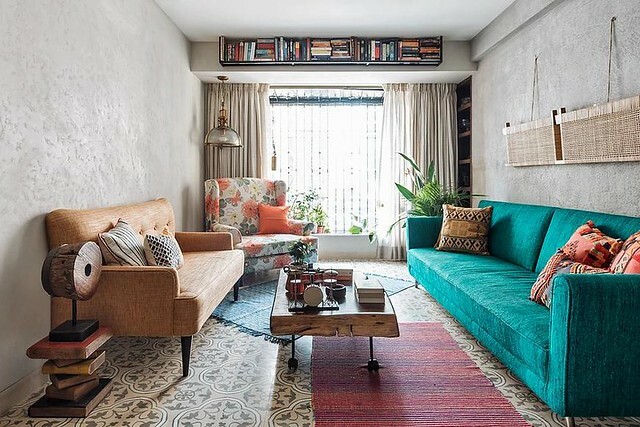 The blue/green sofa is a customized piece that is upholstered in raw silk from cottons and satin. 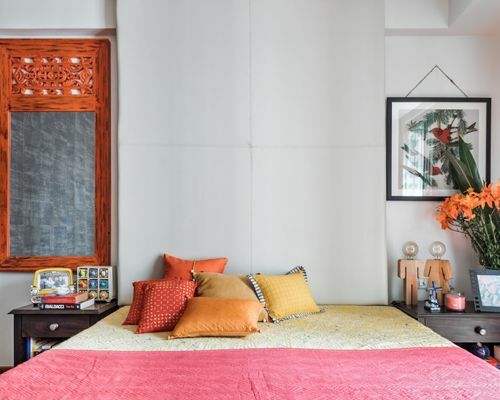 The art piece above the sofa is a headboard from Baro, while a Tanjore painting hangs above the chest from Magnolia. 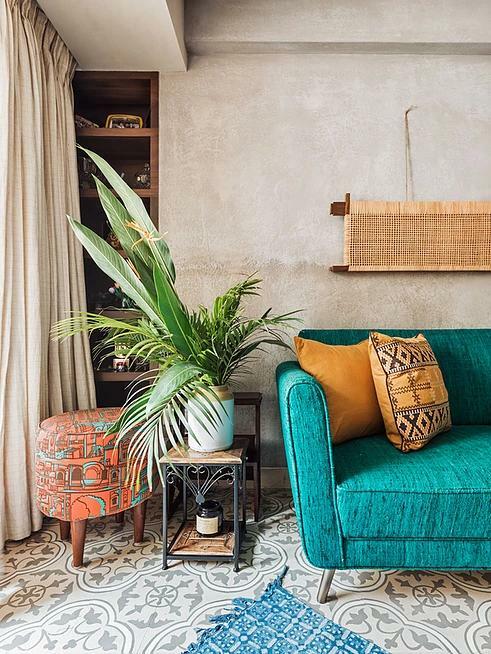 The accent chair by the window is upholstered in fabric from Sarita Handa. 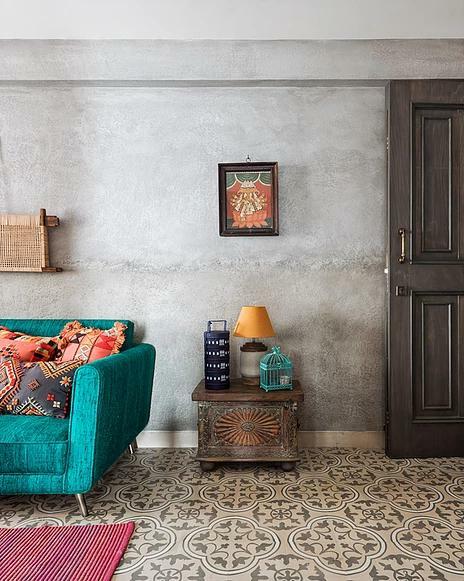 The pendant light from Gulmohar Lane lends an elegant finishing touch to this frame. Why color coordinate pieces of furniture? This is a perfect example of how to make disparate pieces work. 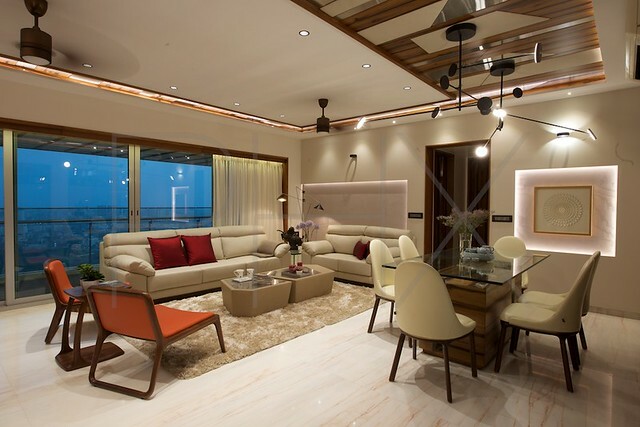 The two-seater sofa is upholstered with fabric from Bharat furnishings. This is a novel space-saving idea for the dining. The American-style diner saves space and accommodates more people whenever required. The wall on the dining has a collection of pictures and other memorabilia from their travels. The backdrop for the bar is clad in handmade and printed copper tiles. The top is a rare blue onyx which is backlit and glows beautifully. The cabinetry is aged wood. 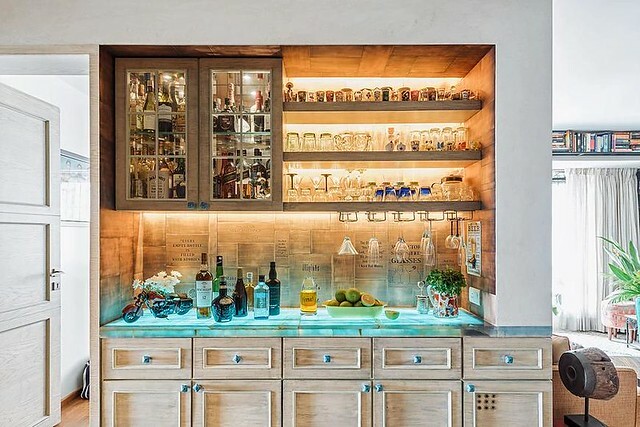 Ranjeet was completely involved in designing the bar as it was his favourite space in the house. 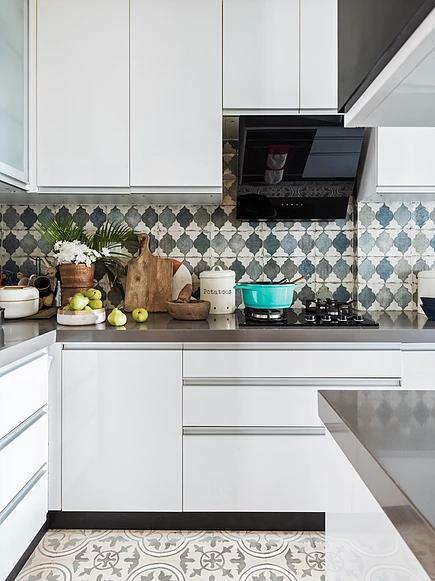 The highlight of the kitchen is the backsplash – the tiles are from C. Tribhuvandas. The floor to ceiling headboard in master bedroom is finished in faux leather. Colors like amber, rust, Mahagony and brown play against the off white backdrop. 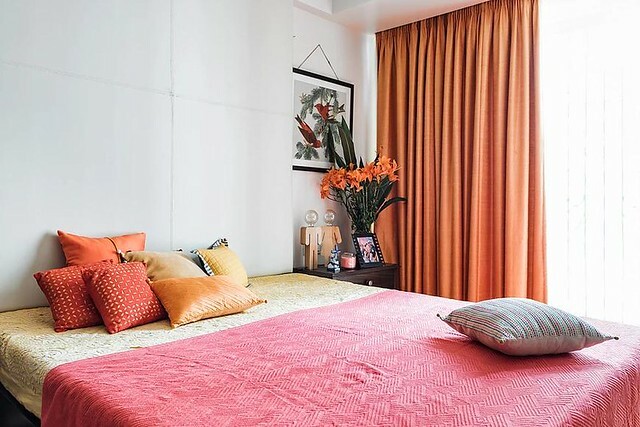 A rustic bright orange mirror above the side table adds all the jazz to the bedroom. 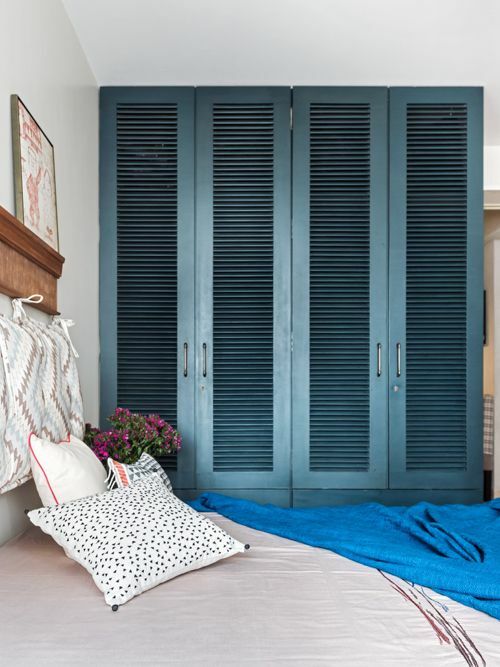 The guest bedroom has an antique blue closet with louvered shutters and a customized headboard in a printed fabric from Warwick. 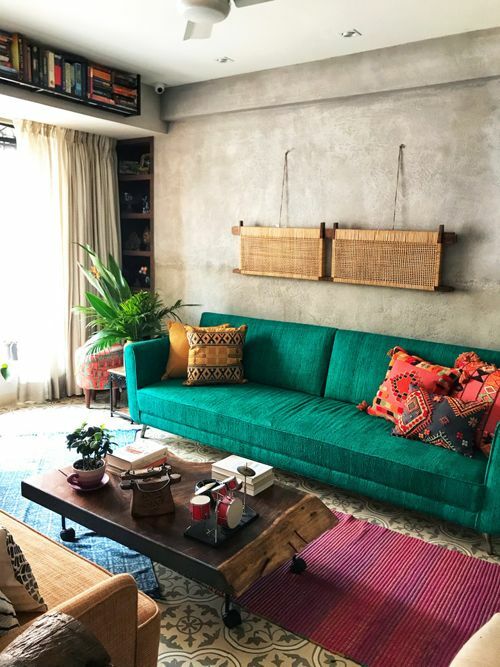 The throw and the cushions are from Freedom Tree. The decal in the kids room is what drew me towards this home. The backdrop of the study table and library unit has a colored wallpaper with a blue study chair. The closet has a chalk board surface which allows the kids to write whatever required. A trundle bed allows plenty of space for open play in the bedroom. 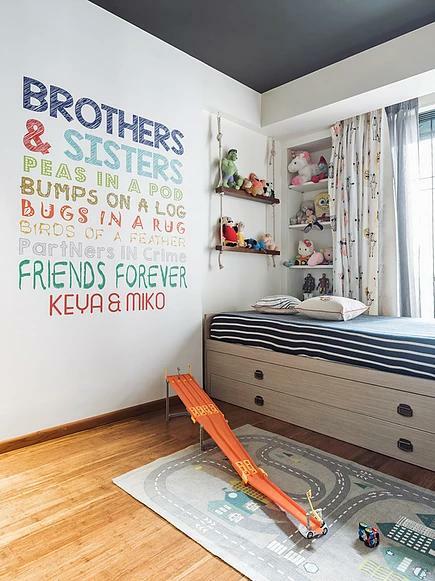 A customized wallpaper featuring the name of the kids, adorns the wall behind the bed. I think I love the bathrooms more than the bedrooms now. 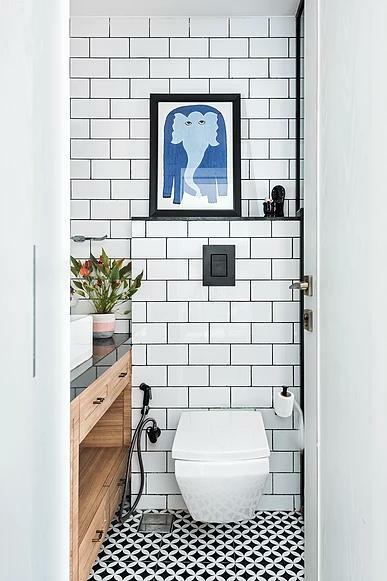 Oh, come on, look at those patterned tiles, the subway tiles, the yellow mirror, and the artwork. It is so kaleidoscopic, and thoughtfully decorated. Did you notice the magazine rack? I truly enjoyed touring this home, and I hope you did, too.